Summer has gone by in a flurry of activity as we've spent countless hours on the phone and on the internet setting up Budd Inlet cruises for landlubbers who want short outings on the water. Scheduling and accepting credit card payments is only half the battle. The biggest (and most fun) part is taking those folks out on the boat. We recently bought a small house on the west side of Olympia, fairly near the marina where Traveler has a slip on E dock. We cleared tons of gear off the boat and into the little house until the boat was empty and the house was full. New PFDs and comfortable seats were pretty much all we needed to have the boat ready for a steady stream of visitors. Calls came in and the calendar started to fill. Our new charter business was off with a bang. We completed eighteen cruises by July 1st, did fifteen in July, and twenty three in August. Today we have a double booking that will bring us to seventy one charters completed this season. I guess I can say we've got the process down by now. We know the ropes... or the lines I should say. 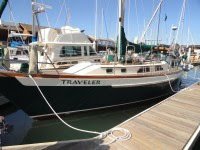 Rick and Ada ran this charter business on S/V Clara June, an Islander Freeport 41, for six years with great success. We chose to manage this season's charters in that same proven method. Starting off, we try to make our customer contacts on a personal level, eschewing online booking and payment technologies and instead steering new clients to have conversations with us over the phone. In this manner we can get a feeling about what our clients are looking for and avoid over selling or under selling the experience. Some people need to be reassured that it will be a relaxing and not a taxing experience, just a nice glide across the water. 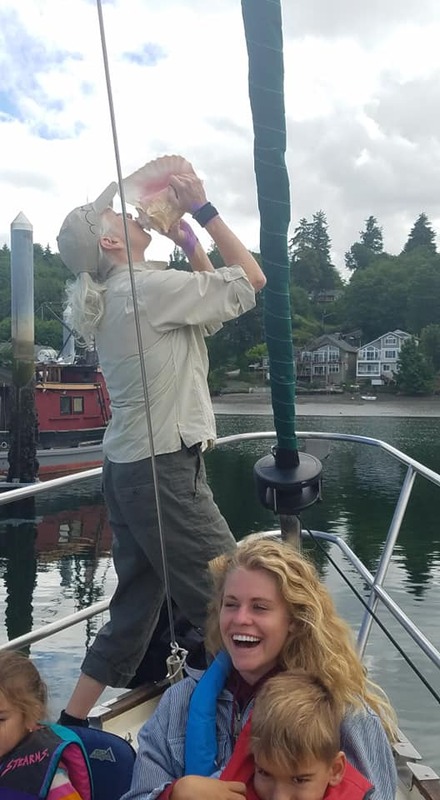 Others want a more active cruise where they raise the sails and steer the boat, or maybe just see the drinks keep coming. Can I bring my infant, my kids and my 90 year old grandpa? Sure. Can I bring a box lunch and a cooler of beer? You bet. 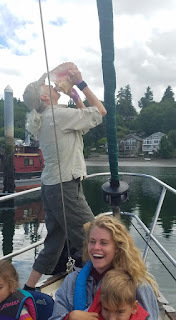 The day of the charter, we bring them aboard early, making sure they've used the restroom ashore, then note the wind and tide as we walk down the dock. We climb aboard and all go below to view a chart of the area and hear a ten minute orientation and safety meeting which sometime stretches longer when they start asking about where we've been and how we've traveled so far. I fit everyone with life jackets. Non-swimmers and children have to wear them whenever they are above deck. Other adults have the option to take them off. We scoot everyone back up on deck and arrange them sitting on the front and sides of the boat in comfortable chairs. With Connie at the wheel, I slowly walk the boat out of the slip. Our prop walk in reverse pulls the boat to port. We need to back out to starboard. So I have to push her out by hand, swinging the bow around as I scramble aboard at the last minute, pausing for a second to wave bye bye and pretend that I'm not getting aboard. Once she's in the fairway I take the wheel and Connie goes forward to button up the lifeline and bring out the conch shell which she blows heartily as we approach the turn out of the fairway between D and E dock. We wave to neighbors on their boats and try to create a party atmosphere as we exit. Connie leans out over the bow pulpit to look for oncoming traffic as I ghost the ship forward in neutral. When I get the OK symbol from Connie, off we go! Connie pulls in the lines and coils them, then brings the fenders and the boarding ladder back to the cockpit. Gotta keep it shipshape. As we make our way out the narrow channel between the mud flats, we chat up the clients to get a feel about how they'd like the cruise to go. Would you like to buzz through the downtown docks? or perhaps over to the log booms? Is Sammy the seal sunning himself on the red buoy #6? If so, we buzz by him/her for a photo. Is there wind? If so, maybe we head straight out, nose into the breeze and get the mainsail ready. If no wind, we serve drinks right away. If wind, I get the halyard ready then ask for help among the guests. We put their strongest person (or youngest) at the mast and watch as they easily raise the first sections of sail. The higher it goes, the more difficult it is until eventually most people can't raise it any more. Then I show them how to sweat up the last few feet. We tension the halyard the last few inches with the winch then drop the topping lift and off we go. Eventually we cut across the shallows and get on a close reach. I warn everyone on the front deck that the big green thing on the front of the boat will unroll and advise them to not let it knock their sunglasses off their heads. Out comes the big Genoa and away we go, usually at a blistering 3 knots. Half of the time, we just motor in the calm flat waters of Budd Inlet. We bring out binoculars so folks can spot seals and eagles, then we serve them an organic fruit bowl or maybe some soft cheeses, salami, and crackers. If they bring alcoholic beverages we serve these to them and keep it coming till they've had enough. With wind, we grab the kids and let them steer the boat. 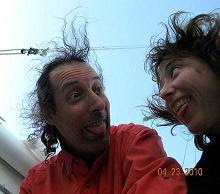 In really fresh wind, everyone takes turns at the wheel just to feel the power of the wind on the ship. Big grins all around. Time for pictures. When my clock says we are at the halfway point we tack her around and retrace our route back towards town. Usually this part of the cruise is downwind, so everything calms down and people relax. Connie normally comes forward with her ukulele and sings a few songs. Sometimes I join her for a hearty rendition of "What Shall We Do With a Drunken Sailor." If there is a birthday, there is a birthday song. If there is an anniversary, there is the couple's favorite "falling in love" song. People get quiet as we enter the narrow channel approaching the marina. We bring out the fenders and lines and prepare for docking. I check the clock to make sure the guests have received their purchased time on the water, then we slowly approach our turn at E dock. Gliding in neutral I swing the wheel to port just when our cockpit lines up with that special sailboat on D dock. At first it looks like we'll ram the dock but as the boat swings around its keel we normally glide in without loosing much paint. Connie steps off with the amidships line and snags a cleat. Then she takes the bow line forward as I step off with the stern line. Our guests have a momentary look of confusion then they realize that they are done! Nothing to do now but get off the boat. We have a flurry of activity as people find lost sunglasses and wallets. I remind them that they should probably take off the life jackets now. Can't take them home after all. There are handshakes all around, hugs even, and lots of group pictures. About half the time one of those handshakes has a tip inside. They tell us how they'd love to go out again, and I make sure they have our business card. While one of us walks them up the dock, the other does an idiot check for items left behind. At this point, with the guests gone, we normally open some beers and relax a minute, eating some left over fruit, cheese, and salami. We talk about the cruise and how sweet everyone was. We talk about the kids and the grandparents, and try to figure out who was with who. It's a nice "after the party" time for us. Then it's dish washing time, and we stow the seats and cushions and bring the dinghy around to the side of the boat to hoist it up in the air. I gather up the trash and we head up the gangway, a little tired but pretty happy realizing how lucky we are to be able to do what we love to do and get paid to do it. What a nice description of your "day at work." I'm glad it is working out so well! Not that I had any doubts!